I don't know if anyone else has unknowingly tried to drive a car with the parking brake on but when that happens, your wheels spin and spin but as much as you are pushing down on the gas pedal, the car will not go very fast or far, especially if you are trying to drive uphill. Lately this has been feeling like my day to day life. I don't know if anyone else can relate with this but sometimes I find myself getting bogged down and overwhelmed by life. It feels like I am working hard but not getting anywhere. To be honest I have been in that season for a while and have had to take a step back, pray about and reevaluate my life and priorities. I figured I must be doing something wrong because Jesus says that "his yoke is easy and his burden is light (Matthew 11:30)." It was hard at first to figure out what I was doing wrong. It was easier to figure out why I would feel overwhelmed in the early days of walking with the Lord. When I first started following the Lord twenty some years ago, I was like a run away train, running ahead of the Lord and doing, doing, doing. Through life circumstances, physical problems, and outright being rebuked trying to do ministry, the Lord taught me to first learn to "be", rest in him and allow him to transform me. Over the years I have made great strides resting in him, making my prayer life a priority, leaning back in him for everything I do and trying to pray without ceasing. What I have discovered is that my priorities and ways of thinking needed to be realigned yet again. The Lord needed to push me out of the nest so to speak. I had learned to be still and rest in him but I had become too comfortable. One day he showed me a vision of a monarch butterfly in chains. Well, it is an illusion to think you can keep a butterfly chained down. The butterfly could easily slip through the chains if it wanted to. I realized I was like that butterfly. The Lord had reigned me in to teach me a few things. I had learned to be still and allow the Lord to transform me. Now he was calling me to fly and I had the freedom to fly but I was focusing on my circumstances and things I interpreted as "chains" that were preventing me from flying. Actually what I discovered is that the "chains" were just a matter of perception. I began to realize that my priorities and my focus was off. As a housewife and mom that also home schools, I thought I was doing the responsible thing to try and finish all the household chores, laundry, meal planning and everything else that goes along with managing a household before trying to serve others outside my home. The problem is, especially as a housewife and mother of six children, there is always more that can be done. The house is never fully clean and organized. There is always more laundry that can be done and children that require attention. As long as the kids are little, there will always be more work that needs to be done. Also by focusing on everything that "needed" to be done around the house, I wasn't even having the right attitude of serving my husband and children. Therefore, if my 3 year old got out of bed for the tenth time at night, I was short tempered because she was interfering with "my" time. 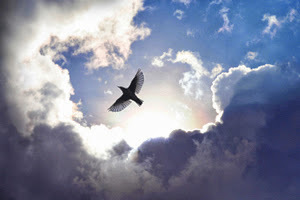 I am realizing that just like a bird needs two wings to fly (thanks Glenn for using this analogy), we need a balance between "being" and "doing" in order that we can fly. Not only that, but our "being" needs to be meaningful, centered on God and our "doing" needs to be restful, out of a place of rest. Every morning now when I start my day with prayer, I ask the Lord to show me if there is somebody I need to serve this day. I have been trying to make more of an effort to recognize the needs of those around me and people I come in contact with. Some days it isn't anyone outside my home he ends up wanting me to serve but he has been calling me to serve my husband and children sacrificially. I realized that by not having the attitude of serving then the things I was doing were becoming more of a burden and felt like work. The irony is, I thought I was first resting before doing but because I didn't have an attitude of service in the things I was doing, it became burdensome. Take the story of Mary and Martha (Luke 10:38-42). The lesson of the story is not that we should all just do nothing but sit at the feet of Jesus and receive. Nothing would ever get done. The lesson is that we start there with an attitude of surrender and then the things we do should be out of an attitude of service. I also realized that some of the things I was praying for were off. I was praying for strength and grace to do all the things I "needed" to do. I am now realizing that if there is something we think we need, what little we have, we should first give it away. It is in giving that we receive. If we are in need of strength, we should give what little strength we have away. If we are in need of joy, let's give joy away. If we are in need of peace, let's give peace away. If we are in need of money, let's give money away. I think about the parable of the talents (Matt. 25:14-30). When we hoard, even the little we have, it shows a lack of true faith, and the things we have rot and turn to dust. It is a rather horrid thing. Who in their right mind is going to want to give someone more if they are just going to hoard it for themselves. However when we give of ourselves and our possessions, we get back more than we ever could have imagined!!! We can not outdo God! I think I might be onto something and this might be the key to the perfect joy that St. Francis of Assisi discovered! "Seek first the Kingdom of God and his righteousness and all these things shall be added unto you (Matt. 6:33)."